Despite the wars and turbulences in world around us, for the Baltic media 2014 was a year of relative stability. No big international media players entered the Baltic media market, but none left, too. Estonian tycoons continued the trend to acquire outlets in the other Baltic countries. The most profitable Baltic media house was TV3 – Latvia who grossed 3.08 millions euros, annual survey “Baltic Media Health Check 2014 – 2015” reports. The research is conducted by Baltic investigative journalism centre Re:Baltica and Media Centre in Stockholm School of Economics for the second year. It analyses the financial reports and audience data of the owners of 75 most popular Baltic media titles in the 2014 (newspapers, magazines, web, radio and TV). In 2014, 34 of the 53 companies that directly own the 75 most popular media outlets in the Baltics have managed to increase turnover. 37 from the companies or 70% managed to make a profit. The most profitable Baltic media house in 2014 has been “MTG Broadcasting” subsidiary in Latvia, “TV 3 Latvia” which grossed 3.08 million euros. 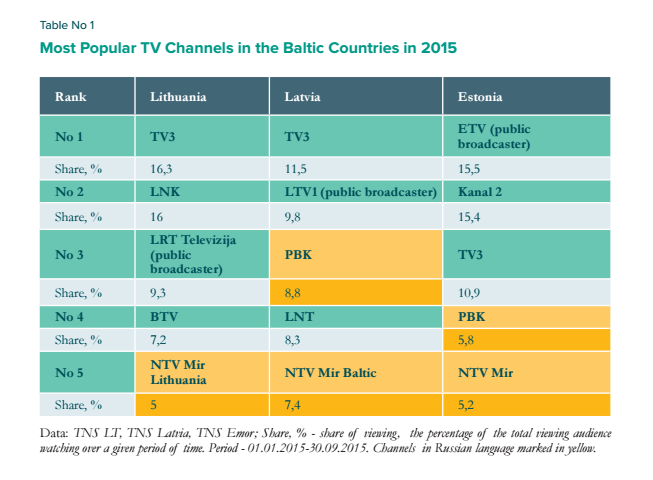 MTG channels dominate the Baltic TV market, but with mixed results. Its second channel in Latvia, LNT, has been losing money the third year in a row since MTG bought it (–1.70 million euros). The second most profitable Baltic media enterprise was MTG’s “Tele – 3” in Lithuania (2.17 million euros). However, in Estonia, MTG loses money with its TV channel TV3 (1.21 million euros). The third most profitable media company in 2014 was Lithuanian media house “Lietuvos Rytas” (2.04 million euros). Reflecting the tendency of the previous years, the biggest business losers in 2014 were the newspaper industry – turnovers have decreased for a majority of TOP 15 Baltic newspapers owners. But the news are not universally bad: only 3 newspaper owners actually lost money (“Dienas mediji” in Latvia, “Diena Media News” and “Šiaulių kraštas” in Lithuania). Estonia’s newspaper industry is the strongest in the Baltic countries. The biggest turnover is for Estonia’s “Postimees” (13.9 million euros). The largest audience: for “Lietuvos Rytas”, while it’s cover of 250 000 people has fallen by 15 percent compared to a year before. The only leading Baltic newspaper who has managed to grow an audience last year is Estonia’s “Maaleht”. There are four titles in Russian among the most popular Baltic newspapers, three of them in Latvia. In Estonia, which has a comparably sized Russian minority with Latvia, only one Russian language newspaper has managed to squeeze in top five, and it is not even a real newspaper: it is a free paper published by Tallinn City Council. Magazines are on a firmer financial ground than newspapers, although 12 from 15 most popular Baltic titles kept losing audiences. It resulted in the loss of profit for only two of them (“Kodu ja Aed” publisher “Ühinenud Ajakirjad” and “Naisteleht” publisher “Presshouse” in Estonia). Radio business was stable, too. The majority of news websites saw their audiences grow (10 from 15), with Estonian-owned “Delfi” keeping the lead in all three Baltic countries. This year, the authors have added in-depth stories about the most important events in the Baltic market to the collection of facts and figures from annual reports and audience measurements. The story of the year is the different ways the Baltic countries have chosen to fight the propaganda from Kremlin-aligned TV channels (read here). In Estonia, the most important media event has been European Court of Human Rights judgement in the case involving “Delfi” about the responsibility of the media for offensive user-generated comments. In Latvia, the authors describe the rise of the public broadcasters which has also lead to increased fight with commercial rivals and the politicians over its independence. In Lithuania, the media event of the year has been the fight to lift a ban of political parties to publish a regional newspapers. Re:Baltica and SSE Riga Media Centre has bestoved a title of “The Person Of The Year” to Estonian pharmaceuticals-salesman-turned-media- tycoon Margus Linnamäe, who became the sole owner of the leading Baltic media house, “Eesti Meedia” and bought both Latvia’s national news agencies, LETA and BNS, in 2014. The latter was quickly sold to another Estonian, Arno Megi, who has a limited experience in the media. The research is available in English here – Baltic Media Health Check. When republishing, the reference to the Re:Baltica and SSE Media Centre must be included. Financial data were provided by “Baltic Target”, audience data by “TNS”.